Social network analysis (SNA) represents how people connect to each other and shows the flow of information in a network. SNA can help identify influencers, key players, disconnected individuals and groups within a community. SNA consists in models that define relationships and interactions between individuals, as well as the patterns that emerge from those relationships and interactions (Baker and Siemens, in press). “paradigmatic examples of graphs with communities. The word community itself refers to a social context. People naturally tend to form groups, within their work environment, family, friends. According to Dragan Gasevic in Data, Analytics and Learning MOOC (DALMOOC) and some authors (Grunspan et al., 2014; Fortunato, 2010), we can identify the importance of SNA in different fields. These include, broadly, sociology, business, engineering, economics, politics, computer science, mathematics, and even more recently, the importance of SNA is recognized in fields such as, physics and biology. For example, in biology science we can verify some interesting works in social contagion (Christakis and Fowler, 2013) and biological networks (Jonsson et al., 2006). Protein–protein interaction (PPI) networks are commonly studied in biology and bioinformatics fields. Fig. 1 illustrates a community structure in PPI networks (Jonsson et al., 2006). The graph shows the interactions between proteins in cancerous cells of a rat. Those communities represent proteins into clusters that have similar function within the cell. Note that the communities are represented by different colours. Fig 1. An example of protein–protein interaction network (Jonsson et al., 2006). different authors identify the importance of social networks, social activities and social interaction as critical predictors of academic performance. I’d like to mention Dawson’s work that has caught my attention recently. Dawson and colleagues (Dawson, Tan, and McWilliam, 2011) demonstrated the value of using social network analysis to measure and visualize student creative capacity. The study involved 76 students of the first year of graduate school of medicine at the University of Wollongong in Australia. They extracted discussion forum data from the institutional LMS (Blackboard). Fig. 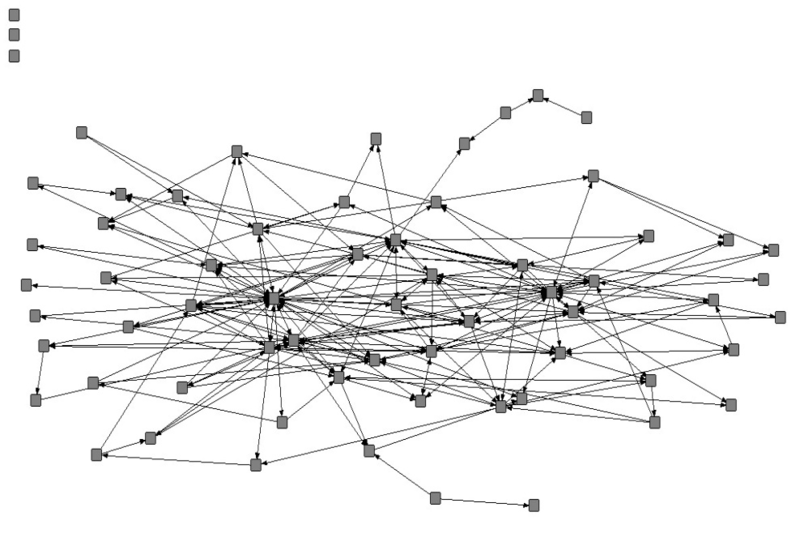 2 illustrates the social network between student and staff participation in the discussion forum. Note that student names have been removed. The graph demonstrates the position and interactions of each student within the network. The full article is here. Elements of networks consist of actors and relations. Actors can be students, organization, blogs and so on. Those actors are modeled as nodes in a graph. The connections between actors make up relations (modeled as ties, edges). Those relations can represent friendship, advice, hindrance or communication. Diameter : the length of the longest path through the network between any pair of two nodes in the social network. Density: the number of existing connections and the possible connections in the graph. Degree Centrality: the total number of social ties a node has. In-degree Centrality: the number of edges coming in. In other words, it indicates popularity or prestige that an individual has in the community. Out-degree Centrality: the number of edges leading out. In other words, it indicates gregariousness about an individual. Betweenness Centrality: the ease of connection with any other node in the network. It is important to mention that if this node is removed, the entire connection would be completely collapsed with the rest of the community, and so you will notice separated subgroups. It plays an important role which is called “Network Broker”. Closeness Centrality: the shortest distance of a node to all others nodes. It is important to keep in mind that it doesn’t work for disconnected networks (actors have zero social ties or groups have no connection to other groups). All the above social networking variables can be computed by using the Gephi software (Fig. 3). 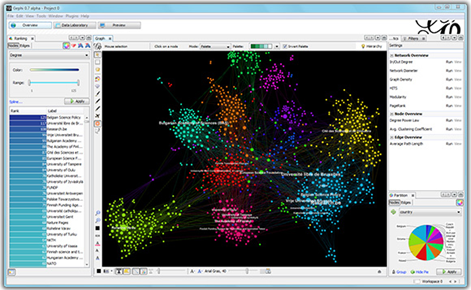 Gephi is a free open-source platform that supports visualization and exploration for all kinds of networks, dynamic and hierarchical graphs. I watched a very interesting hang-out with Shane Dawson. Shane Dawson is a researcher on social network analysis and co-developer of The Social Networks Adapting Pedagogical Practice (SNAPP). The SNAPP is an open source tool that performs real-time social network analysis and visualization of discussion forum activity within popular commercial and open source Learning Management Systems (e.g. BlackBoard and Moodle). Network analysis for the study of learning can be applied at larger scales, such as in schools and higher education. Data can be from social media such as blogs, twitter, e-mails, discussion forums and many others. SNA is increasing rapidly: The Horizon Report: 2014 Edition (Johnson et al., 2014) points out the social media adoption in educational sector as “fast trends” over the next one to two years. In my view the SNA represents a powerful idea: we can measure how knowledge flows across networks of people and organizations. Step 1: Data collection: the actors involved in the network. Data comes from social media (e.g. Blogs and Twitter), survey questionnaires, learning management systems (LMS) (e.g.Desire2Learn, BlackBoard, Moodle, etc.) or many other resources. Step 2: Software involved supporting the search for patterns such as Gephi software and The Social Networks Adapting Pedagogical Practice (SNAPP). Step 3: Analysis of the network: clusters, statistics, the metrics revolve around the concept of centrality, and so on. It’s important to note that it requires extreme attention to privacy and ethical issues. So my concern: how to deal with ethical issues once you have total access to personal information? Who gets to see the SNA data and in what format? Education institutions must consider privacy, policy and legal issues when collecting, storing, analyzing, and disclosing personally identifiable information from students’ education records to third parties for data mining and analytics. All ideas and contributions are welcome! Christakis, N.A., Fowler, J.H. (2013). Social contagion theory: examining dynamic social networks and human behavior. Stat Med 32, 556– 577. Dawson, S., Tan, J. P., McWilliam, E. (2011). Measuring creative potential: Using social network analysis to monitor a learners’ creative capacity. Australasian Journal of Educational Technolog, 27(6), 924-942. Fortunato, S. (2010). Community detection in graphs. Physics Reports, 486(3-5), 75-174. Grunspan, D. Z., Wiggins , B. L., Goodreau, S.M. (2014). Understanding Classrooms through Social Network Analysis: A Primer for Social Network Analysis in Education Research. Life Sciences Education, 13(2), 167-178. Jonsson , P.F., Cavanna , T., Zicha , D., Bates , P.A. (2006). 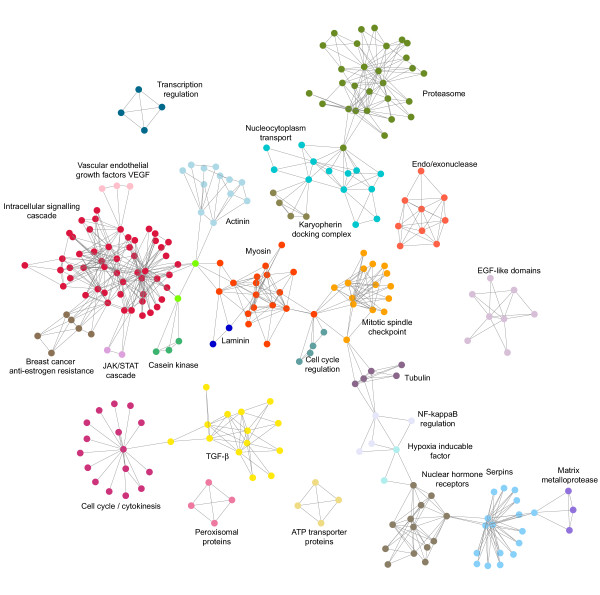 Cluster analysis of networks generated through homology: Automatic identification of important protein communities involved in cancer metastasis, BMC Bioinformatics.